I started out with a speech impediment and flat feet – I had to practice my Rs and take dance lessons. I ended up dancing with the Kirov Ballet at Covent Garden, hurt myself and became an actress by default. I started with a James Bond movie at 20 and I clearly didn’t know what I was doing. I finished that and went into theatre and shocked the newspapers, who kept saying I’d failed miserably because I was now being paid 12 pounds a week playing Nora in Ibsen’s Doll House instead of being a movie star… I just felt that I had a lot to learn, and I didn’t really want to run three paces behind a man with a gun, wearing short skirts. It wasn’t really what I had in mind. I’ve been fortunate to have had a really varied career: East of Eden, obviously; Wedding Crashers is huge right now, so I’ve got a whole new younger generation who know me as ‘Kitty Kat’; and then there’s those who know me as a Bond Girl. That was a million years ago. I’ve played Maria Callas, Marie Antoinette – a lot of period work. I even made a move about the boat people in Hong Kong, shot in Penang. It’s called the Keys to Freedom. I actually had to learn Cantonese overnight. They got this young Cantonese Hong Kong actor and he said, they want you to curse in the most horrible way possible at the woman who runs the whorehouse (in the scene). I said well, can you translate it for me into English? And he said, no, there are words in Cantonese that the English haven’t even discovered – but trust me, this will have an impact! So I learned this thing and then the next day all the people there on set went Oooh! And then I tried a bit of it in a Chinese restaurant about a year later in England and they went Oooh! Nineteen years ago I started [the TV series Doctor Quinn Medicine Woman] and it ran for seven years; it’s in 98 countries and still plays every day in America and France. Apparently it plays in China too. Somewhere in Time is huge everywhere. It’s the longest running movie in the history of Hong Kong cinema – a year and a half! In fact it was so crazy that when it came out and it ran for over a year I came out it here at the invitation of Sir Run Run Shaw who sat me next to him just because he had to check me out and ask, why this movie?! People watched it fifteen, twenty times. Chris Reeve was my closest friend in the world after making that movie. I’m very involved with the Christopher Reeve Foundation and people with disabilities, in fact we’ve ramped our whole house. Thanks to Chris we met some extraordinary people with disabilities. To help organizations that don’t have a voice is an extraordinary thing, and that only comes from having had some success in my artistic ventures. It has been a huge privilege, being able to pass a message or advocate for global water rights, or work for the American Red Cross in Africa. I’ve been supporting this programme, My Day for RA, because one of my best friends and the woman who told me how to paint developed rheumatoid arthritis and we didn’t know what it was at the time. She’s a health nut, but all of sudden she was with me one day and her feet blew up like balloons, and her hands too. She was in so much pain, she couldn’t pick anything up, she couldn’t dress herself. They didn’t test her for RA until she came to them having looked on the Internet, and they got her on Enbrel, and she now can paint, has a life. But I’ve met a lot of RA patients now who didn’t get treatment in time. The good news is that for some reason [film producers] don’t think I look my age. I’m 60 in February. The bad news is that I can’t really play 40 because there’s plenty of 40-years-old who like to play 40. So they meet me and say, well she can’t really play the grandmother… But I am playing inappropriate older women. Cougar du Jour! My husband had to request that we lighten up on the cougar work, however I think it’s wonderful. I have girlfriends who are cougars, and I just play one, which is a lot safer. I can be happily married, have six children and just embarrass myself. Sometimes I think I’m the only one who hasn’t had all the plastic surgery done – well I haven’t had the facelift anyway – and I keep thinking, do I, don’t I, do I, don’t I? Maybe I should – like the British actresses, Judie Dench and Maggie Smith – just nab all those roles with my natural wrinkles. I have dual citizenship. We live in Malibu; we don’t have a home in England any more. We had a beautiful home in Bath, over a thousand years old. We had it for 26 years and it’s the love of my life, but the expense of keeping a manor house… it came to the point where I had to say goodbye. I love going back to England and a huge part of me will always be British, but there’s something really exciting about living in America. It really is the melting pot of the world. I have six kids and my children were raised there. It’s quite funny, parents often contribute to helping in the classroom. They got me to mark some papers – which wasn’t exactly what I had in mind. I’m quite a determined ‘A type’ personality, and when I discovered that every single one of them had made the same mistake I realized that I had cracked a curious problem in the American system. I was putting red circles around ‘flavour’, ‘favourite’ – all the ‘ours’. Then they very kindly said, you may go now! Please go and be an actress and leave us with the education. One of the kids has suddenly become a rock musician. He’s been discovered by the head of Warner Brothers – he’s fourteen. We’re incredibly excited. I’ve come up with a new word : I’m a ‘Modie’, a mother and a roadie. My husband is a director and we produce movies. I just finished a film I really love called Love Wedding Marriage, with Mandy Moore, shot in New Orleans. We did Walk the Line, the Johnny Cash one. He was on Dr. Quinn back when nobody cared about Johnny Cash, and my husband James Keach directed him, and we became very good friends, June, John and I. Johnny said, one day someone’s going to make a story of my life and I don’t trust anyone in the world, but I trust you; what do you think story should be? So James went on tour with him, as did I, and came back to Johnny and said, it’s about redemption – about coming back from hell in a belief in a higher power and the love of a good woman. We named my twin sons after their godfathers, one Johnny and one Kris, for Christopher Reeve. We have another [film] coming out later this year called Waiting for Forever that stars Rachel Bilson. I love finding the scripts, working on them to make them better, getting great writers to come in and do rewrites. The casting and the editing is all done at the house too so I can see how you can turn really good movie into a great movie just by moving scenes around. It’s fascinating as an actress to be on the other side. It gives you a huge advantage when you’re acting because you know what they need. I’ve had three near death experience. One time, I was in Madrid making a movie playing Maria Callas and I got bronchitis. They sent in a hotel doctor, but the nurse who injected me hit an artery and I got anaphylactic shock. They resuscitated me, but I’d left my body and saw what was going on, and realized at that point I wanted to live. I saw the white light and tunnel and everything, and I said please, put me back in my body; I want to raise my children, not waste any time in my life and help other people. People say why do you do some much and I say well, when you’ve actually almost not been here anymore you have a completely different perspective on everything. My mother (pictured below) was from Holland; she lived in Indonesia from the time she was 20 in a tea plantation, and was incarcerated for three and a half years in World War II, in three camps. I took her back there about 20 years ago and she was able to tell her story. That’s what the whole Open Heart [project] is. She said, darling when life’s tough and you think some things are insurmountable, go out and help someone else. And when she was in the camps and they had no food, medicines, nothing, she said ‘I nursed until the end of the war. I nursed all these people who were dying, and all these men they brought in with dysentery, and I laid them out and tried to talk to them and caress them and help them, and that’s the only reason I was able to stay sane’. She said when times are tough, help someone else – it’ll help you. And that’s always been my mantra. And then I came up with this little squiggle which became the Open Heart [symbol], which has almost become a whole philosophy in America. After 911 my prayer was that somehow as the world becomes smaller we can open our hearts to our humanity, and be in the present moment, and be open and receptive to other people’s ideas and culture. I had one necklace made for myself, from my painting, and when I did Dancing with the Stars I was wearing it, and met the people from Kay Jewelers and they loved the symbolism. I said well as long as we can have a foundation and help people with it. I paint for a living and I raise a lot of money with my art. I love to be creative; it really doesn’t matter if it’s walking around the garden picking vegetables and coming up with some great meal, or picking flowers and painting them and making a flower arrangement, or creating a role, or being on the other side of the camera helping create a film. Now I also design home furnishings and we actually make them right there in Mainland China; they do amazing work. I don’t do anything that the press tend get terribly excited about. It’s like: she’s happily married and has six children and they seem to be well behaved, end of story – next! She’s wearing that outfit this week, oh, that’s of interest! And her hair’s still the same – how boring, she hasn’t even coloured it differently! But Dancing with the Stars was fun. As far as America’s concerned right now, that is my claim to fame. Forget that I’ve won awards for acting or whatever, or the OBE. No – Dancing with the Stars! It isn’t often a designer has to rein in his vision for Hong Kong’s high-end club scene. Yet as Tom Dixon surveys his latest landscape, he has a few lingering regrets. Tazmania Ballroom in SoHo, the latest nightclub from the creators of Dragon-i, already boasts geometric wall buttresses, clustered globular chandeliers and brass pool tables, with imitation book shelves in white plaster that give it an ironic scholarly tone. Yet, “I was thinking water dripping down granite, and moss on the walls”, Dixon laments. “And there was going to be a small fish and chip shop. But there wasn’t enough room.” It’s a unique notion of high style – and one that may well have had Hong Kong hipsters faltering a little in their skinny jeans. But that’s kind of the idea. Dixon has been cheerfully pushing the boundaries of British style since he was first discovered in the 1980s, as legend has it, as an untrained art-school dropout in London, welding bits of scrap metal into furniture. Despite a string of commercial successes, he has managed to keep his work fresh, blending a feel for solid craft with a curiosity about technology and the unexpected ways it can be used. His knack for showmanship hasn’t hurt either, and whether giving away chairs for free in Trafalgar Square, or custom making them from molten plastic on stage, Dixon has always been able to command a good headline, at home and abroad. His aesthetic services to the empire haven’t gone unrecognised: along with various product design awards, Dixon received an OBE in 2000. Yet Dixon has found it hard to relax completely into his successes. While most top names in product design hold contracts with a handful of different firms and collect the royalties, he has found the model uncomfortably limiting. Since leaving the helm of British homeware store Habitat, the designer has been striving to build a platform for his work on his terms. Now, under the umbrella of his Design Research Group, Dixon has his main furniture and lighting label, Tom Dixon, and part owns small interiors arm, the Design Research Studio and modernist Finnish furniture manufacturer Artek. But the creative responsibility weighs heavier this way. The pace of change is faster and the competition is growing rapidly. Thanks to digital technology, products can be made more cheaply, in smaller quantities, and closer to home. So just as aspiring writers can self-publish their books online, young designers can now make a sketch on their computer, convert it into a digital file and find a local factory to send it for production. It’s a concept that Dixon explored in his latest furniture and lighting line, Industry. This has led him to wonder why design innovation hasn’t yet exploded on the mainland, where turning a blueprint into product is cheap and relatively easy. Dixon travels often to the mainland to have things made and to visit vendors such as Design Republic in Shanghai, and he still marvels at the speed and ease of production. As his own boss Dixon has allowed himself to take on a range of low-yield passion projects. He works with artisans in developing countries, helping find ways for them to preserve their skills and compete with cheap industry. One project with the British Council in Jaipur, India, inspired Beat, his popular series of hand-beaten brass lamp shades. His Finnish connection has prompted a different kind of deliberation. Artek is apparently considered a national treasure by the Finns, who are protective of its reputation and its designs. Some of its furniture mainstays haven’t changed since the company was founded by architect Alvar Aalto in the 1930s and it has had Dixon thinking hard about notions of legacy and longevity. His latest preoccupation is creating items he can sell with a 1,000-year guarantee. In the meantime his interior projects are allowing him a little more room to play, while pushing his British design agenda even further. The Design Research Studio fashionably reworked the language of stuffy members’ clubs for London’s Shoreditch House a few years ago, sending design ripples globally, and the Tazmania Ballroom is likely to inspire tributes to its mischievous mix of study, pool hall and James Bond-style bling. Trendy young Hongkongers may not find moss on their walls this summer, but they may still be served chips on the side of their whiskey sodas. It seems Dixon’s services to Britain’s global street cred remain secure. For a man who assembled “the Kitchen Chair” in his early years from random, welded metal objects, Tom Dixon’s body of work has grown in sophistication, although it can’t perhaps be called completely grown-up. Below are some of his landmark designs, most of which put a hefty dose of fun back into function. 1988: Dixon’s slender, avant-garde S-chair is put into production by Cappellini, bringing good posture to the masses. 1989: With its iron wire frame, in orange or white, the Pylon chair takes an architectural approach to sitting. 1991: The Bird chair presents an unusual combination of rocking chair and chaise longue. 1994: The multifunctional light/seat Jack Light proves that British manufacturing is still affordable. 1997: Jack comes stacked under Dixon ‘s former company, Eurolounge, before making a comeback, solo once more, earlier this year under the Tom Dixon label. 2001: First produced on demand and on stage at furniture shows, the Fresh Fat chair (below) brings a new glamour to extruded plastic. 2004: Launched during an “anti-design kick”, the best-selling Mirror Ball is a failed attempt to create something that has no identity of its own. 2007: Beat vessels become Dixon’s tribute to tradition, with each hand made by craftsmen in northern India. 2010: Easily flat-packed and made from discarded wood, Offcut is an exercise in eco-consciousness. 2010: Void lamp is designed in patriotic reference to Olympic medals. For Smart Travel Asia, written in 2007, regularly updated. First you have to get to Laos. Then you can enjoy the incredible temples, the charm, shopping, and laid-back lifestyle, not to mention some fine Luang Prabang boutique hotels. 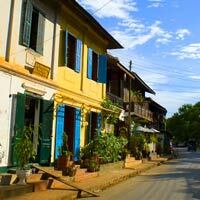 THERE IS a reason why Luang Prabang remains the town that time forgot. It’s bloody hard to get to. Snuggled well in the treacherously undulating northwest of Laos it was, until recently, served by just two alarming modes of travel. The first was Lao Airlines – a carrier essentially blacklisted by the US Embassy, the UN, and other companies that prefer their employees whole. The second was a punishing ten-hour bus journey from the capital Vientiane, at the mercy of bandits, and a million sharp turns. Yet the lure of gilded spires, saffron robes and cobblestones was strong, and still the travel pilgrims prevailed. So things are different now. In 1998 a fancy modern airport was constructed 2km from town, and a few years later Bangkok Airways, Thai Airways and Vietnam Airlines opened up the route with direct flights into Luang Prabang. Lao Airlines still flies regularly and many like myself – pursuing this elusive Luang Prabang Guide – still brave it without a hitch. The roads are still winding but they are mostly well kept, and banditry has lessened. This may be because of the armed, alarmingly plain-clothed blokes you might find on board, but hey, that’s all part of the adventure. Buses run from Vientiane through Vang Vieng and range from the eight-hour air-conditioned VIP bus for US$11 (which includes a stop-off lunch) to a cheaper local option, which is a good three hours longer. Both come loaded with exuberant karaoke entertainment. Luang Prabang is actually also served by the river during the wetter seasons. A ferry from Vientiane’s Ban Done river port can be scenic but cramped, and may take up to a few days, while a speed boat can make it in about eight hours. Still, both end up being more expensive than the flight, and timetables change constantly. Try the Lao River Exploration Services (www.jetboat.laopdr.com) for more. A visitor’s first sight of the old town is always a doozy. Glorious French-Indochinese architecture joins traditional tribal houses in a gaggle of small districts, each centred around a wat (temple). This medieval urban plan spurred UNESCO to tag the town as a World Heritage site in 1995, and it keeps a sharp eye on developments in the area. Now of course many of the villas and shop houses have been carefully converted, meaning plenty of places to eat, stay, and shop. Your arrival by bus will be greeted by a pleasant array of options. Large, shared tuk-tuks taxi scores of people around town, dropping each off after the other – lengthy but cheap at around US$1. These can be rented exclusively for more, and from the airport may cost US$3-$4. Alternatively, hop on the back of a moto (motorcycle). As a couple you’ll find your driver game to take you both – with your luggage – in a spirited bid to earn a bit more money and join that potential Asia-wide Fear Factor contest for Maximum Bodies on a Bike (at my last count: five.) There’s also the moto sidecar option which is good fun on smooth roads, but a bit rough on cobbles. Once in town, bicycles are a great way to move around, especially around sunset when the temperature drops. A standard basket-fronted bike can set you back as little as US$1 a day (7pm-9pm), while a mountain bike may cost US$2-$3. Motorbike rental in Luang Prabang is prohibited for visitors, though there are some companies who will rent to you, ferry you out of the city centre, and let you explore further afield from around $10 per day. The wonderful thing about Luang Prabang is its scale: there’s plenty to see, but a few morning strolls can take most of it in. The earlier the better in fact, since many folk roll out of bed at 6am to offer alms to the resident monks (in a ceremony known as takbat). Luang Prabang has no shortage of either monasteries of wats (over thirty at the last count) and for many visitors this is the source of its charm. 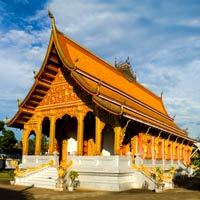 Wat Xiang Thong (admission US$1) is widely considered the grandest. Located near the tip of the northern peninsular, it was built for the royal family in the 16th century and is a prime example of the area’s temple architecture. Look out for the large tree of life mosaic on the rear wall. The conical Phou Si wat at the top of the town’s central mound provides a great lookout for sunset, while the longboats stored at Wat Saen give you a sampler of the town’s boat festival in the autumn. For a peek into Lao’s religious history check out the detailed stucco reliefs at Wat Mai or the creature-strewn façade at the Bamboo Forest Monastery, Wat Pa Phai. Many find that the Royal Palace Museum is a good source of knowledge; whether religious, royal, or revolutionary. Though the royal family were unceremoniously kicked out in 1975, the new government preserved both the buildings and their contents, leaving murals, statues and other regal paraphernalia – yours to see for US$1. Don’t miss the Pha Bang, the Lao’s most sacred religious object, and be sure to ask about its adventures through Asia. All that sightseeing can definitely take its toll, and this is a good time to check out the price list at your nearest massage parlour or Luang Prabang spa. There are plenty of these around, but the most sophisticated is probably the Spa Garden (tel: 212-325 or spagardenlpb@hotmail.com) – set in a pretty garden oasis, and ready to pamper visitors with fluffy robes, slippers and herbal teas. Massages range from US$4 per hour up to the princely sum of $25 (for a full sports massage), while facials and scrubs are yours from $15, and uber-indulgent three-hour packages certainly don’t break the bank. A smaller sister spa can also be found on the main strip. Another established massage spot is the Kamu Spa (tel: 212-092) on Xiang Thong, fronted by a pretty Asian restaurant. The Kamus are a local ethnic minority, and a traditional Kamu massage combines oil sometimes quite painfully with strong palm strokes (1 hour US$3.50), though the spa does other gentler treatments. As the sun goes down the night market starts to emerge, flooding parts of Xiang Thong Rd with silk swatches, cushion covers, lanterns and what not. Pick up a funky pair of slippers for US$2, or a bed throw for around $15, and feel free to haggle. However remember that Laotians get embarrassed by obvious anger or over excitement, so keep it light. For a different kind of retail therapy, Okpoptok Textiles (www.ockpoptok.com) is a beautiful two level shop house filled with locally woven goodies, from clothing to wall hangings. The shop displays info about traditional techniques, motifs and costumes, and can arrange informal interactive demos for those interested. However its products are a far cry from night market prices (or quality), and be aware that a good wall hanging here could set you back more than US$100. Finally, for something entirely different the Three Elephants Café/Tamnak Lao Restaurant opposite Villa Santi has started to offer daily cooking courses (tel: 0205 173-154 or tamnaklp@yahoo.com.au) for up to eight people. Led by two local chefs and an Aussie resident, guests get to haggle at a local food market, cook and eat two full meals’ worth and then walk off with a cute homemade cookbook. Just watch out for the shifty resident dog. Restaurants have vastly increased in sophistication (or at least variety), and visitors can now find themselves enjoying curries, burgers and gourmet French cuisine alongside the delicious local fare (like steamed Mekong fish with young ginger, red pork curries, and bamboo salads). The most obvious place to start would be Xiang Thong, the main strip, where cafes spill tables out onto the sidewalk. Up nearer the quieter end of this street lies Café Des Arts (tel: 252-162), set apart by its watercolour wall art (by the owner’s brother and for sale, naturally), and tasty US$4 make-your-own salads. A more upscale art and food experience can be found at the Samsara Restaurant and Gallery (tel: 254-678), a refined and comfy spot with an open-air roof terrace, a thoughtful menu and a stellar wine list. The Restaurant Luang Prabang Bakery Guesthouse is a popular choice near the market with passable fish ’n’ chips, pizzas and Lao mains on the menu (though give the wine a miss), and the trendy but bare Daofa Bistro will satisfy anyone craving a good crepe, or a happy hour cocktails (7pm-9pm). Further down south on Xiang Thong lies the wonderful JoMa Bakery Café (tel: 252-292) – an old villa that blasts coffee-tinged air-conditioning and proffers a tempting array of decidedly un-Laotian snacks for a few dollars each. A haven for the heat-weary, and better yet, all organic. Try their delicious iced cocoa or a safe, filtered water-washed Greek salad. JoMa also shares its premises with Mulberries upstairs, a free trade silk gift shop (info@mulberries.org). This gracious combination is only really matched in the town by the lovely L’etranger on Ban Aphay (booksinlaos@yahoo.com), which sells 60-plus kinds of teas, shakes and smoothies, stocks a mini library with books that can be rented by tourists (to residents it’s free) and screens art house films most nights. Go for a little cultural entertainment at the old wooden Hong Kong Restaurant (tel: 212-241) next to Wat Visoun, which along with your Chinese buffet offers a range of options, including a Lao traditional band, a traditional costume and folk song show, and – a little bemusingly – “The Original Giant-Giantess Best Show in Town” which no one seemed able to adequately sum up. Tamirind meanwhile (opposite Wat Nong) doubles up as a lovely, original gift shop – combining Lao snacks and tasting platters with recipes, tableware, herbs and seeds – all for sale. Best visit at lunch though, for it closes at 6pm. Down at the southern part of the Mekong things get local, with small dark shophouses offering shaded meals along the river. Laotians sit here and chat at fruit juice stands, and whole fruits are sold on the pavement. Further along things start to spruce up, with quaint guesthouses, small gift shops and massage parlours. Enjoy views of the lazy brown Mekong at somewhere like Lao Vegetarian – good for tasty tofu or a fruit shake – or Bouasavanh Restaurant (tel: 212-869) with its good local fare. Or try ‘cocktails et jazz’ at the sleek, antique Couleur Café (tel: 254-694) tucked just down a side street. Alternatively L’Elephant Restaurant Francais (tel: 252-482) across from Wat Nong is one of the town’s more renowned fine dining establishments. The delectable menu du chasseur here can set you back as much as US$18 (a small fortune) but at least you can pop it on the credit card. Finally try a wander along the serene Nam Khan river for a bite at the lovely Apsara Restaurant, or stop by the little Sala Café (tel: 254-738) for herbal teas, martinis and ice creams in comfy wicker armchairs. This is not a place for night owls. Aside from a few establishments the town tends to wind down at 11pm, with bars and restaurants closing around the same time and streets emptying fast. This means that many simply stay on drinking where they ate, though there are a few pockets of activity to seek out. On Xiang Thong these seem to be Le Tam Tam Garden (tel: 253-300), reinforced by pot plants, fairy lights, two pool tables and a karaoke bar, and the bare but sports-loving Nao’s Place (tel: 253-497), packed on game nights due to the big screen TV. The spot where the Nam Khan river turns near Wat Aphay has given rise to the Hive Bar (hive_bar@yahoo.com) – a moody chillout space that advertises tapas and home made peanut butter. Adjacent is the Lao Lao Garden. Lao Lao is the country’s popular rice-based tipple and the garden offers deals on a variety of fresh juices with the brew, alongside burgers and barbeque. They also do veggie burgers here for the herbivorous. If you are feeling a little more intrepid then talk to your tuk tuk driver about a visit out to Dao Fa Nightclub or Duang Champa on the outskirts of town. These two spots are where the Lao youth go to party; the former a smaller affair with its DJ shouting above hip hop and Lao pop tracks, and the latter larger, with an industrial Asian kitsch thing going on. But be warned, this is an After Hours night out in the sense that you get to stay up until midnight – at which point the lights bang on, and the dance floor promptly clears. Cooler winter months are popular visit time, but braving the spring – the hottest season – will certainly beat the crowds and preserve the sleepy atmosphere. Still, reserving accommodation is rarely necessary – there’s so much of it about. 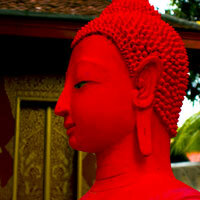 On with our selection of Luang Prabang hotels, boutique hotels, budget places and guesthouses. Starting at the top, one could reside like royalty at the undeniably grand Maison Souvannaphoum Hotel, once the home of a prince. Tastefully managed by the Singapore-based Angsana, the gleaming white estate can be found opposite the town fountain, and features only 24 rooms in total, most of which boast their own balconies. Rooms are suitably lavish, modern, and guests can get wrapped, buffed and massaged outside in one of three spa pavilions. The pool is a tad boring for such a glamorous affair – however a few happy hour cocktails in the Elephant Blanc Café should ease any such concerns pretty quickly. The lovely 3 Nagas (now run by Alila) at the northern end of town has large studio rooms with a trendy Southeast Asian flavour, and introduces its guests to the Laos traditional shoes-off policy. The minibar is relatively pricey but if you head outside to the patio café you can savour a shredded cooked buffalo salad with roasted sesame seeds and betel leaf for next top nothing. 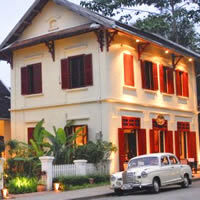 Their separate Lao fine dining restaurant across the road also promises upmarket, thoughtful meals for a similar price. 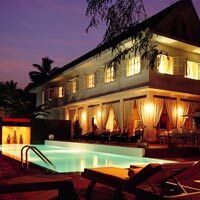 Nearby, the charming Villa Santi is the epitome of colonial Luang Prabang boutique hotel chic, and like the Maison, was once home to royalty. 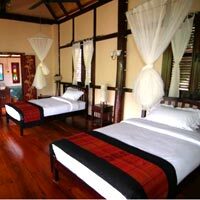 The rooms feature ample, tasteful doses of rosewood furniture and Lao silk furnishings. In-room enjoy a mini-bar, writing desk, a safe and, in the toilet, a genuine bathtub for a long hot soak. The 52-room Villa Santi Resort & Spa can also be found a few kilometres outside the town. This is a pleasant French colonial-style villa recreation, 6km from the hotel. It was built in 2001 with 48 rooms and a couple of suites. Several rooms have balconies with nice mountain views and all offer mini-bar, writing desk, satellite TV and a comfortable bathroom. 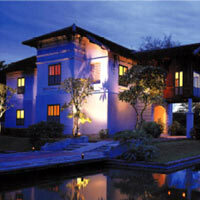 Both places are among the best hotels in Luang Prabang. Still in the north, Amantaka, from Amanresorts has added its luxurious, if understated, footprint, just ten minutes from Luang Prabang International Airport. 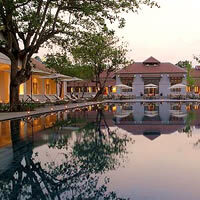 The private complex of 24 suites is a leisurely stroll from Luang Prabang town and 38 magnificent temples. Ranging from 70sq m to 120sq m, the French colonial inspired suites enjoy high ceilings and classical décor. Expect old-world treats such as writing desk, dining area, drinks cabinet, dressing area, and spoiling bathroom with twin vanities and a deep, deep bathtub. Relax under mango trees in a private outdoor space. Pool suites include an eight metre pool, stylish in black. Lao-French influence extends to the restaurant while the boutique art gallery focuses in on the indigenous artwork and handicrafts of local communities. Expect WiFi, tennis and yoga to keep you busy if the temples and local culture don’t. While UNESCO considers The Ancient Luang Prabang to be a rebellious blot on the landscape, this modern four-storey structure is nevertheless bang in the middle of everything, and quite fun for a stay. Previously (and ironically) the New Luang Prabang Hotel it has a scatty but upmarket feel, with sculptural dark wood furniture perked up by local textiles, and baths and showers open to each room. Check out the terrace upstairs for breakfast above the melee. On the much sleepier Nam Khan River stands The Apsara, an old converted shop house formerly known as the Duang Champa. Most rooms have views of the river – or at least the trees that fringe it – and are upmarket but interestingly designed with funky exposed concrete floors, batik accents, modern Asian art, and four poster beds – along with high ceilings and original details. There are no computers here but BYO for Wireless Internet. The restaurant is stylish, though laid back, with baguettes and soups for a few dollars and creative fusion dishes in the evening. For those that like to lose themselves in a really good hotel there’s The Grand Luang Prabang, a sprawling five-star property about 4km out of town. It has an Art Deco elegance to it, though a few corners need a little retouching. Rooms are large, airy and elegant with all the modern amenities, and the hotel thoughtfully lays on a regular shuttle bus to town (and even a shuttle boat during the high season). The Lao Spirit Resort is a good thirty minutes into the bush, and is a pleasant upscale eco resort with traditional, terraced bungalows and polished interiors. Run in coordination with the Tiger Trails adventure tour group, this Luang Prabang resort sports fun outdoor showers and an open restaurant – close enough to hear the mahout’s karaoke wafting over the river from the elephant camp. With minimum electrical appliances this is a great way to comfortably commune with nature, though one wonders why some of the local nature needs to be kept in cages. Much further into the urban network yet still beyond the fringes of the old town of Luang Prabang lies La Residence Phou Vao, a very posh sanctuary type resort. The 34 bedrooms and suites are a riot of rosewood and cotton with lofty views, and along with cocktail bar and infinity swimming pool, it boasts conference rooms and a garden spa. It’s also good for its shuttles into town. Out around this area there are a number of more affordable options, including Le Parasol Blanc Hotel, which is modestly comfortable and books nightly traditional dance shows during the high season. Going down a tad there’s the Manoluck – friendly and comfortable, but perhaps more suited to a business stay than a holiday. For affordable but prettier accommodation you should try the stretch around Wat Sop, where a smattering of lovely quiet, clean villa guesthouses can be found for reasonable nightly rates. Here the Villa Soxai has a small family feel to it, but with its gorgeous dark wood interiors, free breakfast on the verandah and views of Wat Sop across the road it’s a winner. Take a top floor room to escape sounds from the reception TV. Senesouk, though alas not sporting cable, still does nice air-conditioned doubles for around US$15. Finally, should you really be saving your pennies it is still absolutely possible to find a clean, pleasant room here with a fan and an en suite bathroom for US$5. Try the streets linking lower Xiang Thong with the Mekong, or a few streets leading off it in the opposite direction, just past the Maison Souvannaphoum Hotel. You’ll not be short of options when it comes to tour providers. As well as the many lining Xiang Thong, even the tuk tuk drivers will have printed rates for trips. A few of these are diverting half days, with the lovely limestone Kuang Si and Tad Se waterfalls good for a splash and a picnic, and the caves at Pak Ou a good excuse for a boat trip. Chock full of old Buddha statues these caves make for an odd, slightly mournful sight, though don’t live up to the expectations of some. Other adventures can of course be taken farther afield. Explore hidden rivers in kayaks, ride elephants through the forest, or trek through the hills and lay your hat at village home stays along the way. Prices can vary from US$20-$30 for one day, and US$30-$50 for two depending on how many people you can drum up to join you. Try Tiger Trails a well regarded outfit that offers varied itineraries, often based around its elephant camp. For something a bit more unique, ask about the two-day mahout course which will teach you to look after and guide your own elephant. Make sure you’re good with a shovel. Alternatively the Grace Travel Service offers a variety of adventure tours to the less travelled east area of the town, which may give you a better taste of the wilderness. Tigers and bears are sadly (or thankfully) no longer found in the hills near Luang Prabang, having escaped to a more peaceful, less populated northern climes over a decade ago. Tiger sighting trips up north are still allegedly possible, but involve days of trekking. 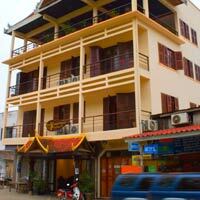 Luang Prabang hotel rack rates quoted here may be subject to 10 percent government tax and 10 percent service charge. Some smaller hotels will require payment in advance. Luang Prabang guesthouses may not always have hot running water, aircon, TV or fridge. The exchange rate is around US$1 = Kp10,000 and Thai Bt100 = Kp26,000. Airport departure tax is US$10, as is the overland immigration tax, though this is sometimes waived. Be aware of where you are pointing your feet in Laos (never at anyone), and try never to step over anyone, or touch them on the head. Remember than many homes will be used to a shoes-off policy at the door. Be very wary of buying medicine from small local pharmacies: the packets may look official but there’s no guarantee you’ll be getting what you asked for. All Lao Service. Tel/fax: (856-71) 253522 (e-mail: alllaoservice@yahoo.com). Takes care of tours, tickets, visas and rentals, as well as Internet and overseas calls. Lao Travel Service.Tel: [856-71] 212725, fax [856 71] 212252 (e-mail: sihayong@laotel.com). Tiger Trails. 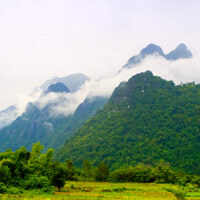 Tel/fax: [856-71] 252 655 (e-mail: info@laos-adventures.com or www.laos-adventures.com). Mala Travel Service. Tel: [856-71] 253-704, fax: 254-266, (e-mail: malatrevel@yahoo.com). Just across from the Kamu Spa.Offers tickets, visas and the more accessible of tours around the area, including Kuangsi Waterfall and a Sunset Trip along the Mekong. Grace Travel Service. Tel/fax: [856-71] 252-360 (e-mail: vongpachang@hotmail.com). Offers a variety of adventure tours ranging from half days onwards. Also rents out minivans and boats. Action Max Laos. Tel: [856-71] 252 417 (email: actionmaxasie@yahoo.fr). Self billed as a specialist in cultural tours and a supporter of genuinely responsible tourism. Amantaka. Tel: [856-71] 860-333, fax: 860-335, (e-mail: reservations@amanresorts.com or www.amanresorts.com). Suites from US$400 (low season) and US$600 (high season). Maison Souvannaphoum Hotel. Tel: [856-71] 212-200, fax: 212-577, (e-mail: maison@angsana.com or www.angsana.com). Garden Rooms US$170-$200, Verandah Rooms US$190-$220. 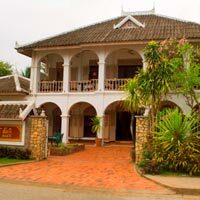 La Residence Phou Vao. Tel: [856-71] 212-530, fax: 212-534, (e-mail: reservations@residencephouvao.com or www.residencephouvao.com). Rates from US$270. The Lao Spirit Resort. Tel. [856-30] 514 0111, (email: info@lao-spirit.com or www.lao-spirit.com). Three-day adventure package for two people, including pick-ups, breakfast, dinner and excursions, US$112 per person. Villa Santi. Tel: [856-71] 252-157, fax: 252-158, (e-mail: info@villasantihotel.com or www.villasantihotel.com). Deluxe twins and doubles from US$170. Villa Santi Resort & Spa. Tel: [856-71] 252-157, fax : 252158, (email: info@villasantihotel.com or www.villasantihotel.com). Deluxe Double US$170, extra bed $30. The Grand. Tel: [856-71] 253-851-7 fax: 253-027-8 (e-mail: info@grandluangprabang.com or www.grandluangprabang.com). Deluxe twins and doubles from US$150, extra bed $25. Breakfast included, as well as transport to and from the airport. 3 Nagas by Alila. Tel: [856-71] 253-888 fax: 253-999, (e-mail: 3nagas@alilahotels.com or www.alilahotels.com/3nagas). Superior Rooms US$85 low season and $105 high season. Junior suite US$112 and $140. Includes Internet and breakfast. The Apsara. Tel: [856-71] 254-670, fax: 254-252, (e-mail: info@theapsara.com or www.theapsara.com). Doubles US$55-$65. The Ancient Luang Prabang. 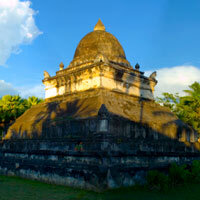 Tel: [856-71] 212-264, fax: 212-804, (e-mail: info@ancientluangprabang.com or www.ancientluangprabang.com). Doubles from US$60. Le Parasol Blanc Hotel. Tel: [856-71] 252-124, fax: 252-496, (e-mail: pbluang@laotel.com or www.vico-voyages.laopdr.com). Rates from US$45-$55 with a free American Breakfast and pick-up from airport. Manoluck. Tel: [856-71] 212-250, fax: [856-71] 212-508, (e-mail: manoluck@laotel.com). Doubles from US$45, Junior Suite $80 including breakfast. No charge for children of ten years and under. No Internet available, but airport pick-up is free. Villa Soxai. Tel/fax: [856-71] 260-299. Doubles from US$20, including breakfast. Senesouk. Tel/fax: [856-71] 212-074 Doubles from US$15. Asian Human Rights Commission [link], 20 November 2009. It may have a recently-restored judiciary and an elected government that claims a strong interest in the rule of law, but Pakistan is seeing little progress in the hundreds of missing persons cases still pending. Pakistanis continue to be regularly ‘disappeared’ after arrest. With the police force exposed as increasingly negligent and corrupt, the responsibility of identifying such cases and intervening has long fallen to the judiciary. Judges taking suo moto action have secured the rescue of numerous persons from illegal military detention in the recent past, and this is widely believed to have been a major motive behind the sacking of the Supreme Court judges in 2007 by then-President and Army Chief, Pervez Musharraf. Yet despite the restoration of the Judiciary with its Chief Justice Iftikhar Chaudhry in March after a long civil struggle and with the support of current Chief of Army Staff General Kiyani, there has been a marked decline in the response from the courts to appeals from the family of the missing. Leading figureheads in the lawyers’ movement, such as Mr. Ali Ahmed Kurd, former president of Supreme Court Bar Association, have been renewing their criticism of its performance. The change has been raising questions about the courts allegiance to civil society versus its sense of obligation to his supporters in the army. In response to this institutional indifference, family members of the missing have taken to camping outside the Supreme Court complex in protest. The court recently relented to one group, stationed there from 2 to 17 November, and assured them that the fate of their loved ones would be examined and their cases tried. But the judges involved have since done little more than make clichéd remarks about the ultimate good of the Supreme Court, while showing no willingness to flex the judicial muscle; suspected perpetrators from the state agencies have not been called or held to account. The proceedings are, in fact, starting to resemble a publicity stunt. Over the past few years the court has heard from various persons who were arrested illegally by intelligence agents and who were tortured in covert military torture cells for months at a time; more than enough to paint a convincing picture. On this basis alone, as people continue to vanish after arrest, the court is obliged to pursue the issue to the very extent of its ability. The most prominent case of state abduction is that of three political activists from the Balochistan province who were kidnapped on April 3; they were taken from a lawyers office by plain clothed officials in one of the state’s conspicuous white vans. Their bodies were found six days later. The lawyer and other eye witnesses are willing to testify, but the courts are not looking into the case. The most recent case brought to our attention is the struggle of a couple in Punjab to ensure a credible investigation into the disappearance of their son, who vanished during a hospital transfer under the custody of police. NGOs have estimated that during the current civilian government around 100 persons have gone missing after their arrest, and efforts to uncover their fate have mostly led nowhere. Political groups in Balochistan have reported that out of the 4,000 supposedly arrested there, not more than 200 have been brought to trial in courts and the remainder are unaccounted for, out of the reach of their relatives or lawyers. The Supreme Court itself has more than 400 cases of disappeared persons pending. Though statistics may vary, the size of the problem is beyond dispute. Enforced disappearances thrive in societies with ill-functioning, dependent judiciaries, which fail to hold state agents accountable for their actions. Under autocratic governments and military regimes a nation’s judges become markedly subordinate, and these are the issues Pakistan continues to struggle with in the wake of Pervez Musharraf. A much stronger political will is required to forge a fresh start. This year Pakistan’s judiciary was restored by the loyalty of the masses, and the laudably steadfast determination of the Chief Justice Chaudhry and his colleagues to rescue the independence of the judiciary. Today its handling of disappearances must reflect this. Civil society needs to see that its judges are not afraid to summon state agents before the law and hold them accountable for their crimes.